To the moon, Cringely, to the moon! Italian Classics by the editors of Cook’s Illustrated magazine. The recipe is very simple and doesn’t require too many pieces of equipment. It is basically made with flour, baking powder, salt, sugar, eggs, vanilla extract, lemon zest, and anise seed. The equipment required is an oven, a mixing bowl, whisk, and baking sheet with parchment paper. Biscotti are twice-baked Italian cookies. Once the batter is mixed, it is formed into a long loaf shape and baked. It is then sliced into individual pieces and baked again. This recipe doesn’t use butter, so the cookies should last a couple weeks if stored in an airtight container. They are a relatively hard biscuit. They are perfect dunked in my favorite tea. The lemon and anise flavors are a unique taste that goes well with the English Breakfast tea that I prefer. The cookies have a nice amount of sweetness too. I would make this recipe again. I bought magazines from a door-to-door salesman yesterday. I hope it is for a good cause. (I hope that I didn’t get taken.) He was a nice young man and presented himself well. He said that he was from Chicago and was trying to learn skills to help him have a better life. I am supposed to get 36 issues of Condé Nast Traveler for $60.00 plus a $10.00 processing and handling fee for a total of $70.00. I know that I could have gotten it cheaper by subscribing from Condé Nast directly, so hopefully the extra money goes towards the salesman and not just to Midwest Clearing, Inc., the company fulfilling the subscription. Yep, the stock earbuds that came with the Sansa Express didn’t work out well while running. They popped out of my ears after a few strides. I found these at my local Target store: Nike Flight Sport headphones . 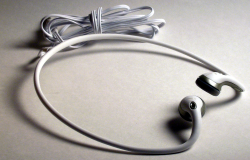 They are designed to fit around the back of your neck, with the cord coming out the back. So I decided to give them a try. They worked out quite well. The ear piece doesn’t actually fit in your ear like earbuds; the band keeps the speakers pressed against, but not in, your ear. The band itself is plastic that is fexible; it keeps it’s shape, but can flex to shape to your head. The cord runs through a channel in the band. The connector worked fine with the Sansa Express. I used them for the first time on Friday, August 31, 2007. I plan to use them on my next run.